The Mumbai Indians beat the Rajasthan Royals by 25 runs in Ahmedabad to move up to sixth place in the Indian Premier League 2014 table. A fine batting display enabled them to post 178 for three before they resisted a late Rajasthan charge to take their fourth win of the season. 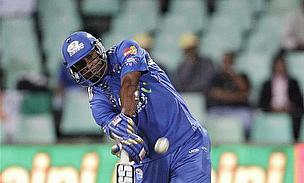 Kieron Pollard took an outstanding catch to dismiss Kevon Cooper as Mumbai restricted the Royals to 153 for eight in reply. Krishmar Santokie, Pragyan Ojha, Harbhajan Singh and Shreyas Gopal all grabbed a brace of wickets to keep Mumbai's wafer-slim hopes of reacing the play-offs alive. Batting first, Mumbai were afforded a solid platform from new opening pair Simmons (62 in 51 balls) and recalled Michael Hussey (56 in 39) as they put on 120 together in 14.3 overs. That allowed Pollard, in at three when Simmons was caught by Cooper off Ankit Singh, and Rohit Sharma, who came in when Hussey was dismissed by the same combination, to hit out with freedom. Pollard blasted 14 in 12 balls with a solitary six and Sharma, run out from the final ball of the innings, helped himself to 40 in 19 balls, with three fours and four sixes. Ankit finished with two for 23. Rajasthan's reply was propped up by Karun Nair, who was one of just three players to reach double figures. He made 48 in 24 balls with four fours and three sixes as wickets tumbled at the other end. Unmukt Chand (2), Shane Watson (5), Sanju Samson (2), Cooper (5), Ankit (4) and Stuart Binny (2) all departed cheaply and when Nair was caught by Santokie off Harbhajan, the Royals were 75 for seven and in deep trouble. Cooper must have thought he had done enough to clear the ropes at long-on before Pollard leapt back, picked the ball up one handed and then showed brilliant skill to keep the ball in play as his momentum took him over the rope. Turning back quickly, he had to dive full length to take the ball as he returned into the field of play to complete a remarkable catch. There was more drama to come as Australians Brad Hodge (40 in 30 balls) and James Faulkner (31 not out in 21 balls) put together a quickfire partnership of 69 to almost double Rajasthan's score. Nevertheless, despite Santokie leaking 18 runs from the penultimate over, Mumbai had enough runs in hand to clinch a win that not only keeps them in the competition, but is also a blow to Rajasthan's hopes of finishing in the top two. IPL Play-Offs - Who Needs To Do What?